Professor Hedges, along with Northwestern President Morton Schapiro and School of Education and Social Policy Dean David Figlio, will speak with reporters at a press conference at 1:10 p.m., Sunday, Dec. 9., at the convention center. RSVP required. 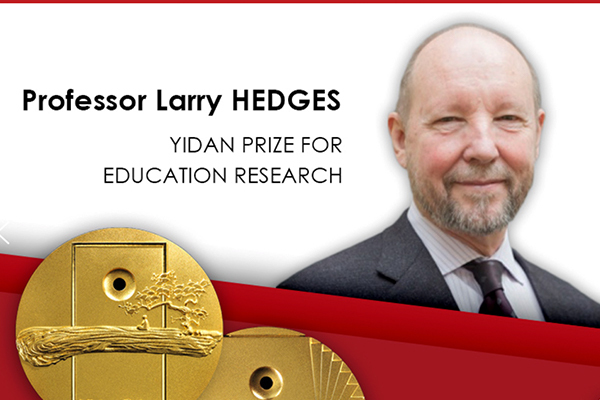 Hedges, now a global leader in education research, was the first in his family to attend university. He will be honored at a ceremony at the Hong Kong Convention and Exhibition Centre on Sunday, Dec. 9, and receive a monetary award worth $3.9 million. President Schapiro is among the nation’s leading authorities on the economics of higher education, with particular exper­tise in the area of college financing and affordability and on trends in educational costs and student aid. He has testified before U.S. Senate and House committees on economic and educational issues and is widely quoted in the national media on those issues. Schapiro has written more than 100 articles and co-written or edited nine books. The books include: “Cents and Sensibility: What Economics Can Learn from the Humanities,” “The Student Aid Game: Meeting Need and Rewarding Talent in American Higher Education” and “Keeping College Affordable: Government and Educational Opportunity,” among others. Dean Figlio is one of the world's most influential researchers on education and social policy. He has advised the governments of several U.S. states and nations on five continents on the design, implementation, and evaluation of education policy. In 2017, Figlio was elected to the National Academy of Education for his work involving school accountability, standards, higher education practice, welfare policy, policy design and the link between health and education.